Next week is Student-Led Conference week! There are no office hours, and students will be dismissed at 1:30pm Monday-Thursday. There will also be a special presentation for 11th and 12th grade students on Drinking & Driving during advisory. Here is the schedule for this week! We have a School Site Council Meeting Tuesday from 5:30-6:30, and are looking for a few more parents to join us! If you are available to come, please email me at swallis@davincischools.org and let me know. 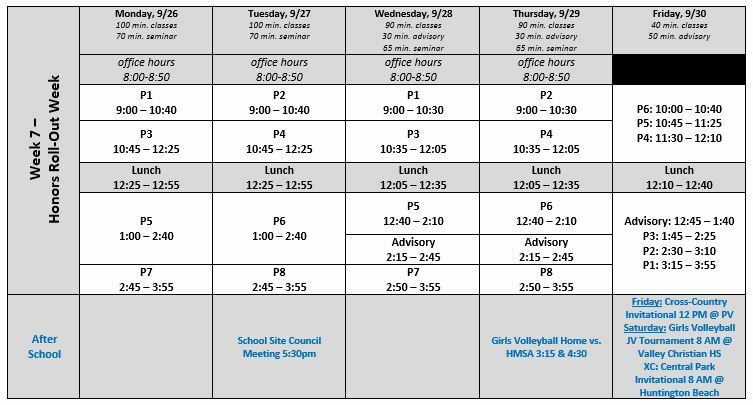 This week we are wrapping up our advisory unit on time & stress management with the students, and the summaries of the lessons are on the attached weekly schedule. As the students are preparing for exams and working on projects, these are important conversations for you to be having with them! One of the many things of which I am proud about DVS is the education we provide for students about the life skills that don’t fit into any particular subject area. Rather than purchasing someone else’s advisory curriculum, our teachers work together to create it and tailor it for our own students. I include the summaries of these lessons in the weekly schedule I post each week so that you can use it as a starting point when having conversations with your kids. I encourage you to watch it and talk about it with your kids this week! We have a visit from a rep from the Air Force Academy on Wednesday after school, and are encouraging 9th and 10th grade students who might be interested to attend – the application process for the AFA actually begins in the 10th grade so it’s important for them to learn about it now! Our first School Site Council Meeting of the year will be on Tuesday, September 27th and we are looking for a few more parents to join us! Please email me at swallis@davincischools.org if you are interested in learning more about this opportunity to get more involved. If you have had any experience playing in a Concert Band or String Orchestra before, please consider joining our Wiseburn-Da Vinci Jazz Ensemble. We perform a diverse repertoire of music from Rock and Pop to Jazz and Latin for several concerts, festivals, and various DV events throughout the year. If you are interested or curious, please join us on Friday, September 16th from 8-9:30am, in the DVS Forum. We will have details about the program, and info regarding borrowing/renting instruments. Please email Toby Harwell at tharwell@davincischools.org with any questions. Thank you! We return to a regular week next week! Our girls volleyball team has its home opener on Tuesday afternoon, and we have a back-to-school dance on Friday evening from 7-10pm. Today our students received their school ID cards as well as a letter with their Powerschool login information, so please ask to see these when they get home. As a reminder, you can help support DVS by purchasing your child’s photo for only $18 at https://staceelianna.smugmug.com/DaVinciSchools/DVS-2016-Picture-Day. With that download, you can print up as many photos as you’d like at Costco and have the grandparents’ holiday presents already checked off So far only 62 families have purchased their child’s photo – we would love to have at least 200! Your kids are beautiful and changing fast! Buy their photos today!! I hope all of our DVS Families are enjoying this beautiful Labor Day weekend! In recognition of Labor Day, there is no school tomorrow. As a reminder, the photos of your students are now ready for you to purchase, and you can help support DVS by purchasing the picture of your OWN KID! You can view and purchase your child’s photo at https://staceelianna.smugmug.com/DaVinciSchools/DVS-2016-Picture-Day . (I recommend purchasing the digital photo and make as many prints of any type you like at Costco!) Thank you for supporting DVS by purchasing your child’s photo! !